last night (sunday) i was held by a tremendous sadness. it hung over me life a spaghetti-western poncho that was filled with time and dust, sortalike my coffeehouse. i found myself examining my quality as a human being, something that’s not a very good idea if you’re in a “self-hating-loser” mood; when you find yourself comparing your life with the lives of others for no reason you can imagine, except to tell yourself that you don’t measure up to anyone, anywhere; yet, when you ask yourself what it means, you have no answer – like you’ve phrased the question you’ve just asked yourself in a language foreign to this planet. a little uncomfortable indeed. i don’t know if my will to live had come under question. thank goodness i didn’t understand the language. i still have the spaghetti- western poncho i wore when i was in my late 20’s. two, in fact. one is red with dark markings and looks fairly mexican. the other is is off-white, grey and black and looks american indian. i used to wear the red poncho a lot. (when you’re young you can get away with wearing practically anything.) i would wear it over my fringed buckskin jacket. this is me and the buckskin jacket a few decades ago. i’ve since reached that age where decades are a basic measure of time like minutes, hours and days. i think decade-marking begins in your fifties. should i be wearing red cons and sporting the swag of untold hand-printed 21st century band tees? btw/the ties on the left-hand side of the picture above are the same ties that are for sale in the store today. they were “decades old” then, older now. 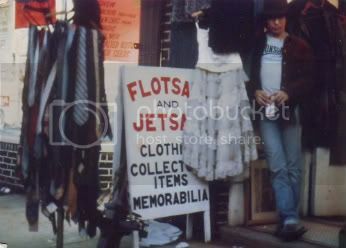 the photo shows me in front of a store in bay ridge, brooklyn, the contents of which i purchased in 1998. it had closed five years earlier and its contents were in a storage locker until i bought everything. you can see the store’s sign in GBM everyday. just walk in and look up toward the back. you can’t miss it. my friend, an artist named Steve “Smash” Toriello painted that sign. he’s the same guy who did the original goodbye blue monday business card (it’s on the blog, a short-scroll back) and was the co-reason that goodbye blue monday is responsible for Tim Burton’s film “Ed Wood” and consequently, Martin Landau’s oscar – i wrote about this in an earlier blog and it’s probably in one of the “Scrap Bar Chronicles”, so you can find it here; myspace.com/scrapbar. it’s the story about a bar i owned from the mid-80’s to the mid-90’s, but the first blogs dealt with things that led me to 116 Macdougal St. and come to think of it, has a whole lot to do with suicide, which leads me to one of the reasons for this blog. David Foster Wallace hung himself. i’m not going to say i know much about him other than that i knew about one of his books, that he’d been a successful writer for a dozen years and on september 12th, he had an appointment he just had to keep. that’s what suicide is to me. i had learned that it might be a good idea to look at it this way some years ago. john irving used a line in hotel new hampshire – “keep passing the open windows.” late in the book, a character in his story chose not to. tragedy? selfish to the enth-power? hell, i don’t know. i can say that suicide got upcloseandpersonal with me some years ago and Mr. Wallace’s decision, while mystifying, made perfect sense – to him. When you gotta go, you gotta go. i had a luncheon date for january 3rd, 1990. the only problem was, my date’s roommate called me at around three in the morning. “Steve,” she said – i could feel there was something really wrong here….the seconds ticked on for days – “Trace,………she’s dead. she killed herself…” i was speechless. i didn’t know what to say. i didn’t know how to feel about it. moments passed. the weight of such tragedy was astounding. “i guess lunch is out,” i said. we both busted out laughing. the intense pressure evaporated, allowing us to find our grief. the next days were a mixture of tears, heroin, a wake and a burial. somewhere in the blur, i placed a flower on her coffin. she had hung herself in the shower of her apartment. if she wanted to live, she had only to stretch her toes or reach up and release herself from the shower, but such was her sense of commitment that night and believe it or not, our relationship wasn’t over after her passing, but that’s another story. about the barbeque……i needed to lighten the title and hell, there was a bbq going on yesterday at the dawn of this writing.